Sara, I'm sorry. When I was at your house and kept cracking jokes about you having Lyme Disease - "Is your Lyme Disease acting up?" 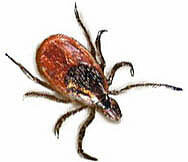 and "Get off the couch, it's not like you have Lyme Disease!" - I NEVER thought you REALLY had Lyme Disease. I thought that the rash on your leg was something other than the characteristic skin rash erythema migrans, transmitted to you by a blacklegged tick infected with the bacterium Borrelia burgdorferi. I never imagined that the headache and fatigue you felt was related to a condition that, if left untreated, could have spread to your joints, heart, and nervous system. I just thought you were tired because you're a mother and four months pregnant and I hear that that's really tiring and a fairly good reason to lie on the couch in the middle of the day and fall asleep for hours. And I'm sorry that when we went to the basement to tear down cabinets and you asked for my help in working on the house you're remodeling, all I did was take photos and make MORE jokes about you having Lyme Disease and getting tetanus and then wandered in the other room to take photos of my feet. I'm so glad that you went to another doctor to get a second opinion and caught the Lyme Disease before it caused any palsy or cognitive disorders and I want you to know that if I weren't with Idol right now, I'd be in your living room smoothing the covers over your shoulders and putting honey in your tea and buying do it yourself home improvement books.